The impressively popular Fortnite Battle Royale currently runs up to 1800p resolution in 60FPS mode on Microsoft’s Xbox One X console. 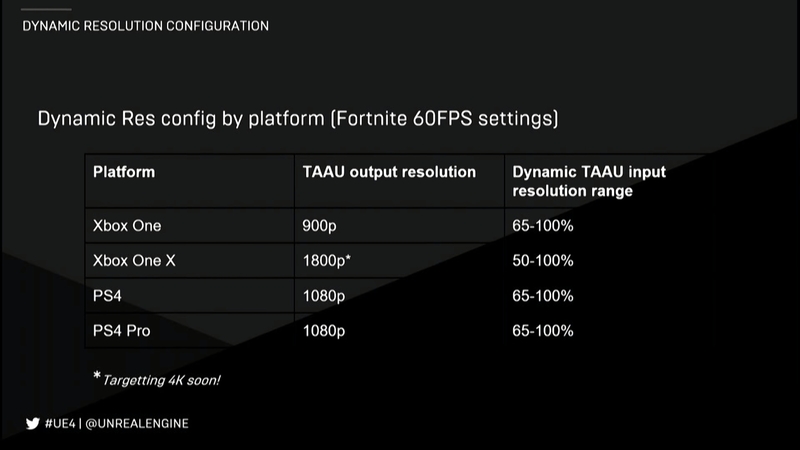 However, during the GDC 2018 Optimizing UE4 for Fortnite: Battle Royale presentation, Epic showed a slide indicated that they are targeting a full 4K (2160p) resolution as the max frame buffer soon on the console. It should be noted that this won’t be native 4K resolution. 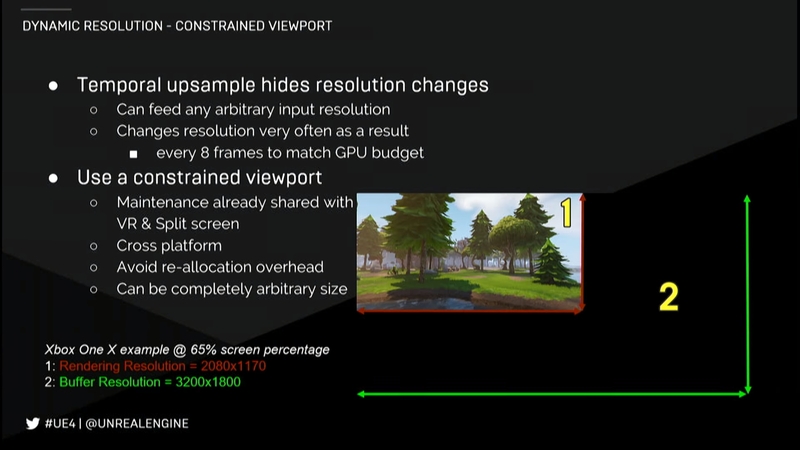 In order to achieve 60FPS mode on consoles, Epic introduced a dynamic resolution scaler that kicks in whenever needed to help keep the frame rate steady. 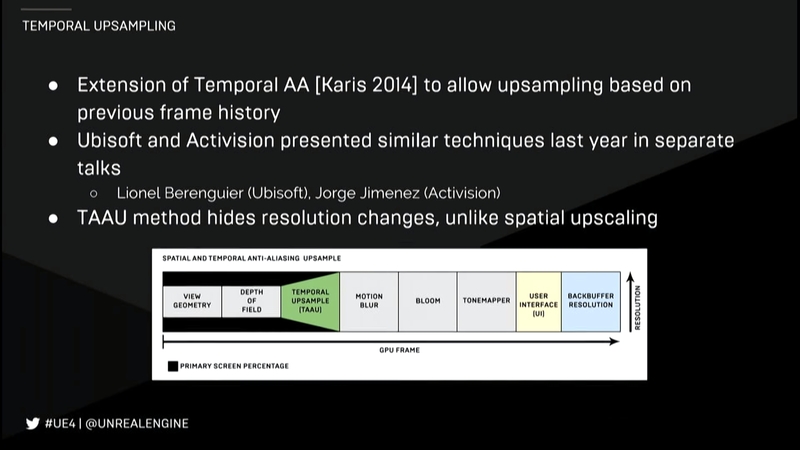 Furthermore, all consoles use the Temporal Anti-Aliasing Upsample (TAAU) to reconstruct a frame buffer in a way that hides resolution changes, unlike the Spatial Upscaling technique. For example, on Xbox One X when targeting 65% dynamic resolution the rendering resolution is currently 2080×1170 which becomes 3200×1800 through TAAU. 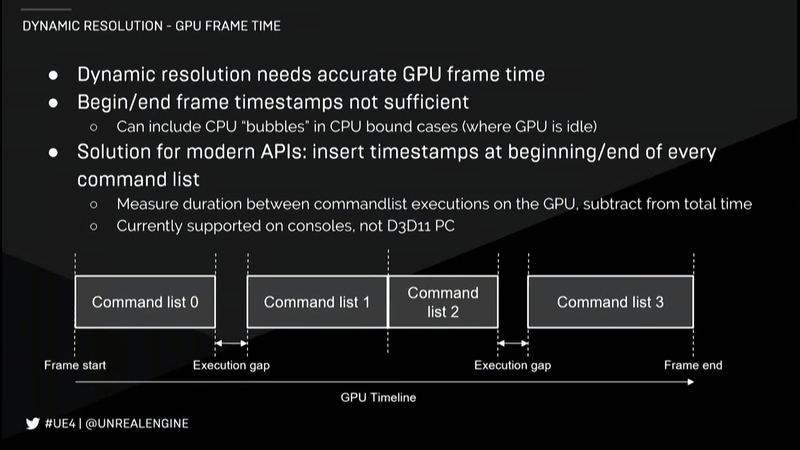 However, when Epic upgrades the maximum framebuffer resolution to 2160p the rendering resolution with 65% dynamic scaling would go up to 2496×1404 – thus delivering sharper graphics definition. This is even more impressive when compared to Fortnite Battle Royale running on PlayStation 4 Pro, where the maximum framebuffer remains stuck at 1080p resolution. This kind of real time optimization via dynamic resolution scaling isn’t currently available on PC. 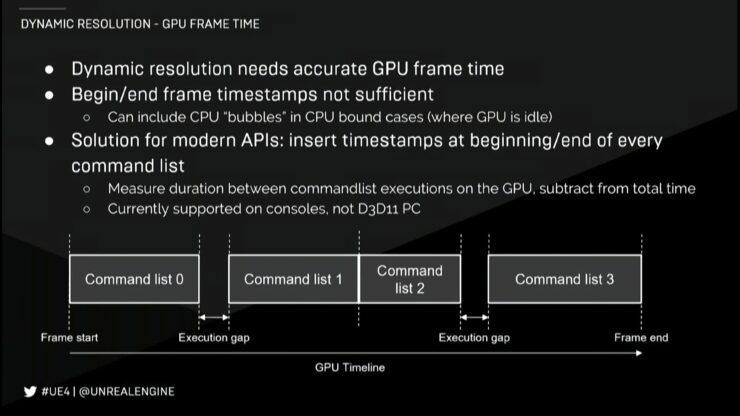 Nick Penwarden, Director of Engineering at Unreal Engine, addressed this on stage by stressing the importance of being able to get a really accurate GPU frame time, which is easily doable on consoles but can get ‘really tricky’ on PC as it’s hard to tell whether another process has added any GPU work into the picture or you’re actually CPU bound. Still, he added that they’re talking with hardware vendors (NVIDIA, AMD and Intel) to see if they can get the accurate data needed to add dynamic resolution support on PC. It would certainly be an interesting option to see in action. Overall, this is truly astonishing optimization work by Epic. 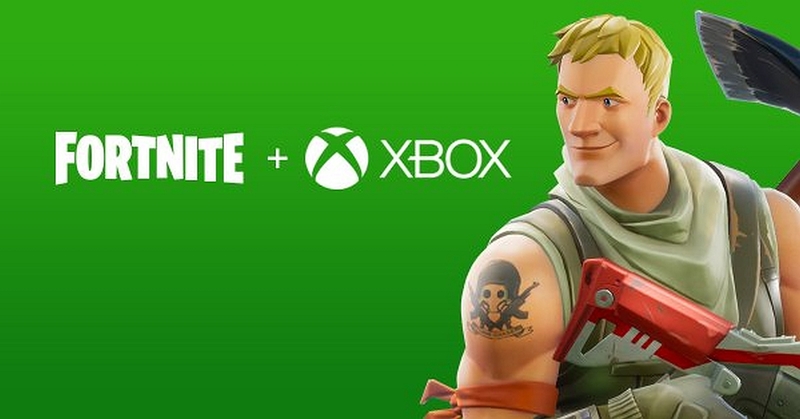 The recent, well-made mobile port also opens up a very real possibility of a Nintendo Switch port, not to mention that this would add another cross-play platform to the existing PC/Xbox One/mobile mix. Currently, it seems like the sky is the limit for Fortnite Battle Royale.